I slept terrible Thursday night. After the Latuda incident, I just couldn’t sleep. It was hot in the house and we had opened some windows, but eventually resorted to the AC, so I went around and shut all the windows before bed. I had a bit of that 1/2 awake, 1/2 asleep stuff until I got up to write the Latuda post, which was about 4am local time. I thought I heard some meowing, like a cat was trapped in a closet (pretty typical scenario for our youngest) but I couldn’t find any trapped cats. So I chalked it up to my sleep-deprived imagination and went back to bed. I finally woke up at 6:30 and so did DH. We both heard the meowing then, and we couldn’t find Saxon. DH opens the back door, letting the dog out, and sees the cat sitting on the windowsill meowing. Saxon had torn open the small hole in the screen, letting himself out to chase bugs, and I had unknowingly closed the window behind him. Poor fellow was out there all night and meowing for half of it! He didn’t seem to get the idea of using the door, so the dog went over and started nudging the cat towards the door with his nose until the idea clicked. The two had a long, affectionate reunion and Saxon doesn’t seem inclined to leave the house again. Moral of the story: It is possible to herd cats! The second anti-psychotic my doctor prescribed for me is Latuda. She must be using it off-label for bipolar because the manufacturer website makes no mention of bipolar, only schizophrenia. The nice thing about it is that it doesn’t have the same weight gain effects as other atypical antipsychotics. The downside, for me, is the nausea. I’ve been taking it on and off for about 3 weeks. Sometimes off because it does make me very sick to my stomach. However, it does wonders for stability. It stopped the Ultradian cycling cold. It’s kept me stable. And until tonight, I’ve been able to handle the nausea. Tonight it made me violently ill. It wasn’t dinner because DH was fine. No, it didn’t start until I took the Latuda. I was sicker that I had ever been on it before. Previously, it had gone almost to the point of dry heaves. Tonight it went further. No, it was not pretty. DH was most wonderful for cleaning up after me. Now it’s 4 am, my stomach hurts, my anxiety is through the roof (even though I’ve tried shoving a little klonopin down there) and I can’t sleep. I think I’ve had about 1 hour of sleep tonight. Between the anxiety and my stomach, I just can’t get any rest. Even after a hand full of crackers, some lukewarm water, and a sip of milk, my stomach still feels horrible. My body does not want this stuff in it. Even though this may be TMI, I felt I had to share it with you in case your doctor ever decides to try Latuda on you. I hope you don’t have the same reaction. But if you so start feeling nauseous, keep an eye on it. Talk to your doctor. Don’t just stop it without your doctor’s consent, nor continue it because you think it will get better or you can “handle it”. It may be more than a simple nausea side effect. Well, I was reading up on the requirements to teach high school, once I found them buried in the state board of education website, (don’t you love broken links?) and discovered there is another whole application process that I have to do before I can take the tests. This process can take up to 6 weeks, so if that happens then there is a very slim chance I can take the tests (with results) in time to teach this year. Since the schools aren’t even willing to entertain the notion of hiring me before certification, this leaves me in quite a bind. Even if I get through all that process, they do a FBI and criminal record background check. Would I even pass that with bipolar disorder? There are so many fees involved too… each test has a fee. There are enrollment fees, application fees… it would be about a $400 job application to teach high school, and I’m not sure I have the self-confidence to do it in the long run. I’m not sure I have the self-confidence for anything. I dreamed about the university position last night. I dreamed that I was doing the interview all over again, only not screwing it up. I really want that job, I just wish I had answered that one question right: which upper division classes would you be comfortable teaching? Well, hell, I can teach all of them (if I have the self-confidence). That’s what it all comes down to in the end: self-confidence. If only I had been hypo-manic instead of stable for this interview, I would have nailed it. This waiting is killing me. If I had done that right, I might have an offer by now. I really hope I get the university job. My self-confidence tells me I can’t do it, but another part of me says I can. It’s all pointless now until I hear back from them. Can I teach high school? I went to the job fair yesterday for the school system. I know they desperately need math and science teachers at all levels. I gave my resume and talked with the high school for a bit. I think they are very excited about me because after I left the table, I was tracked down by one of the teachers and he gave me his card. Before I made it to the next school (middle school) I was also tracked down by one of the assistant principles. He was trying to lure me into teaching their program for students needing special help in graduating. Not slow learners or disciplinary students, but students who need extra help because life has not been kind to them. (They may have children already or a non-supportive home life.) He gave me his number and asked me to call him next week if I would like a tour or to sit in on a class. The downside is that all of the certification tests are expensive! They have a general test and a professional teacher test (why they have two is beyond me) and then there are the subject tests. At $100-$150 each, that adds up quick, plus there are fees. To qualify for just one subject, I would be spending about $400 all total. Is it worth it for essentially a job application? Granted, I would have my certification for 5 years. I wouldn’t make very much money, but I would be “in high demand” as they put it. Teaching school here would be a nice, easy commute but teaching high school is hard. Very hard. However, I like the idea of touching lives. Of making a difference. I have no children and I’ll never win a Nobel Prize, so basically I have no legacy. Once my life is over, who will remember me? I will have left no footprint on society or this planet. Only a lot of empty pill bottles. I am getting maudlin. I need to keep an open mind. High school might be the place for me after all. Or is it only my lack of self-confidence telling me that I can’t teach at a level higher than that? I don’t know. Also, how will my mental illness figure into all of this? I have to take a drug test – how will I pass it with my Klonopin? Anyway… do you think I should hand over the money and go for my certification? I am starting to get hypomanic with this job interview coming up. This always happens to me, at least if I am interested in the job or not so depressed that nothing helps. The job is for a teaching position, and I will be teaching one of my favorite topics. I am not sure whether I want the job or not – it’s on a yearly renewal contract basis. It’s also an hour drive each way. Blech. I hate that long of a commute, especially in winter with the ice storms we get out here. As for the hypomania, I am trying to control it without too many drugs. I have a lot of trouble focusing, and I tend to want to talk too much, too fast and interrupt. I have to curb these urges for a job interview, but usually being hypomanic helps me – I’m charming, outgoing, and friendly. I give the outward appearance of being all the things I’m not: focused, interested, comprehending, and extroverted. I know hypomania is considered “bad” but all these effects help me get through an interview and get the job. Oh we all know the bad side of hypomania… one of my biggest vices is shopping. I needed to go shopping to buy a new suit for the interview because all my old ones are two or three sizes too big. This meant new skirt, blazer, blouse, camisole, stockings, and I bought a “briefcase” like purse. At least I am wearing shoes that I already have. I had such a hard time restraining myself from buying jewelry, extra camisoles, extra skirts, extra blouses, etc. Fortunately, I didn’t even go near a shoe store. I have developed a passion for shoes over the past few years and good ones at that like ecco or Clarks – $100 shoes. Gotta keep the debit & credit cards in check! The ugly… we are all susceptible to poor judgement when hypomanic. We may say things we don’t mean, give offense, find offense or be quick to anger, drive too fast or too recklessly. I find myself saying things I shouldn’t or interrupting people, trying to finish their thought for them. It’s a bad habit that only occurs when I am hypomanic and it’s hard for me to control. I know it really pisses people off too. My brain has bounced ahead along so many paths that I just can’t wait for the other person to catch up. Finish talking so I can talk! Ugly. Bad impression. Rude. Offensive. I usually am a happy manic but I can be short tempered, especially when under a lot of stress. I do drive too fast or I might drive and eat or something else distracting at the same time. I’m on overdrive, why shouldn’t my car be? Potentially ugly consequences. I am taking all my medicine and I really don’t think that there is anything else my doctor can do for me. I’m not a real danger to myself or others. I just have to keep aware of how I’m feeling and acting to make sure I am being appropriate. Use the cruise control to eliminate speeding. Follow the directions on the GPS, and focus on the road. Try not to let my nerves get the better of me. Fight my mind to focus on what people are saying and don’t cut into conversations too early. And go easy on the bad, self-depricating jokes. I killed my reputation at this last company with too many self-depricating comments that others took seriously. So if I work on my focus, which is really hard for me, and try to plan and prepare as much as possible, hopefully I can get through this interview with flying colors. The professors there are so smart that I am terrified of sounding stupid. Remain calm. Smile and nod and pretend you understand. Try to think of questions that don’t sound too stupid. I wish they made a medication for self-confidence! I start at 8am and meet with nine different people. It’s going to be a busy day! Wish me luck! It’s been a month since we lost my cat Goldie. Although she wasn’t one for demanding a lot of attention, I still miss the little things she did, like moving the water bowl and pointing at you with her paw when she wanted to be petted. She was also a self-brushing cat, which was pretty fun to watch. She would take the brush right out of your hands then rub her cheeks on it. She didn’t meow, she would meowf. When she jumped down, there was always an “oof” involved. The house is definitely a lot quieter now. As for the other cats, I think they miss her too. Our tuxedo cat, Tux, tried to go out of the house a few times; presumably to look for her. The only time he ever tries to leave the house is when we have a missing cat. After it was apparent that she wasn’t returning, he started spraying the couch. He only sprays when he is nervous. We had to wash everything a couple of times. Boy was that one stinky week! Since then, he must have accepted her loss because he has stopped all that. Sometimes he sleeps on the same blanket/footstool that she would sleep on. We didn’t get rid of everything. Didn’t have the heart too. But the house will gradually have less orange fur in it as time goes by. One place that definitely still carries her scent is the scratching pad. 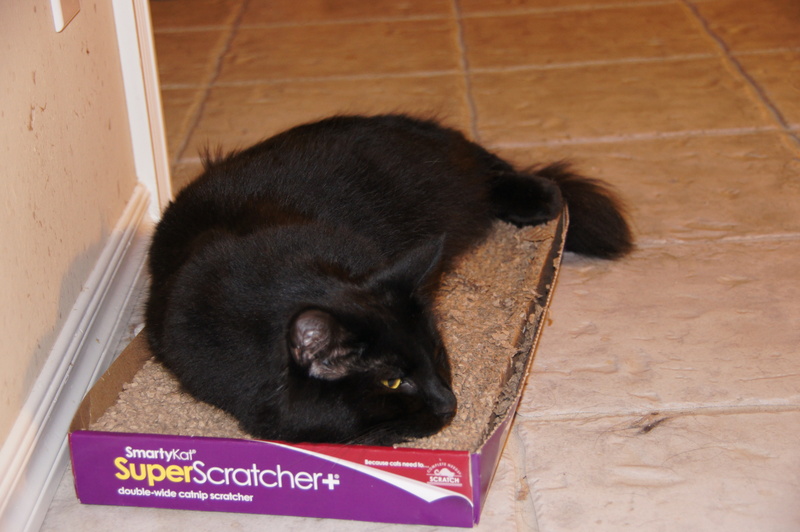 I’ve noticed Sax lying on the scratching pad lately. He doesn’t scratch it, he just lies there looking forlorn. (He probably doesn’t look as forlorn in this photo as usual due to the flash.) We don’t put catnip on the scratchers, so it’s not that. It was her scratcher and everyone knew it. Maybe I am reading too much into the cat’s behavior. Perhaps they don’t miss her at all. But I have read articles where cats go through a mourning phase when they lose a housemate. 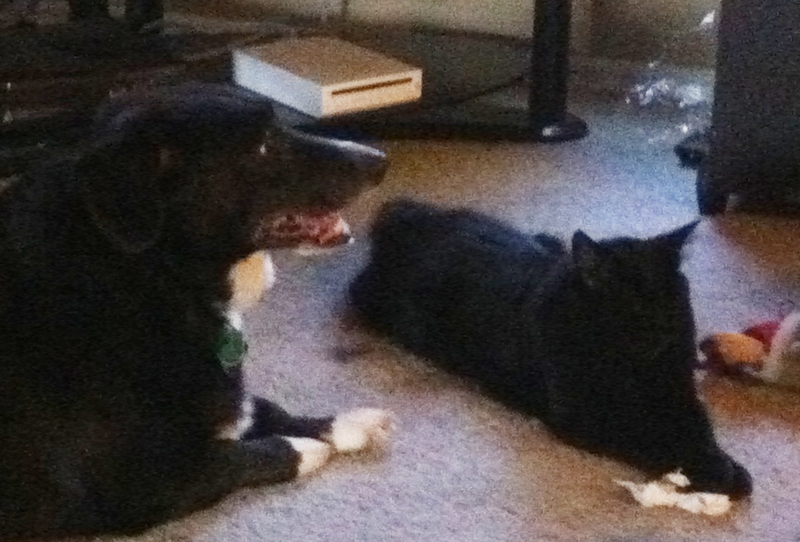 Perhaps my fur children are mourning the loss of a sibling in their own way. 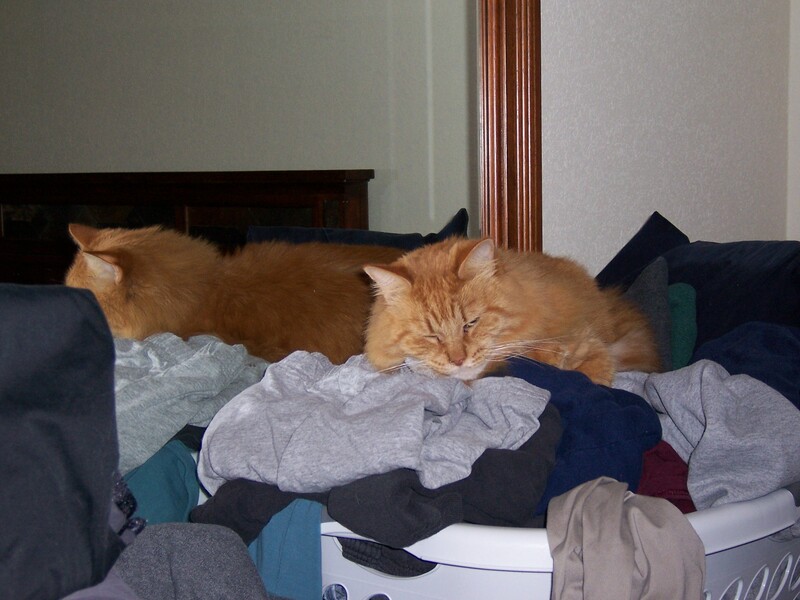 I found an old picture of Goldie when she had climbed in the laundry basket to take a nap, so I thought I would share it with you. She had so much personality it’s difficult to summarize her life in any amount of words. She was sweet, she was grumpy, and she was loving. Despite all the troubles our family has been through over the years, I think she was happy. What more could a cat-mom ask for?